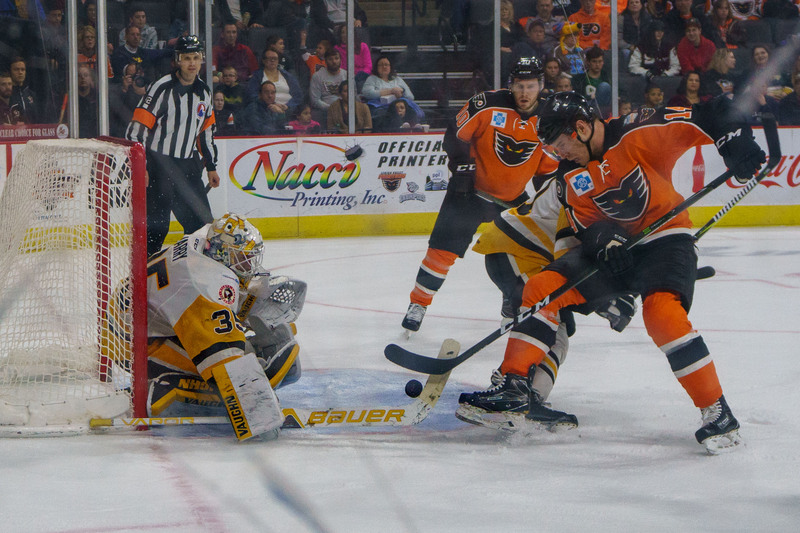 The Phantoms salvaged last weekend by defeating the Hershey Bears at the Giant Center on Sunday, 4-2. 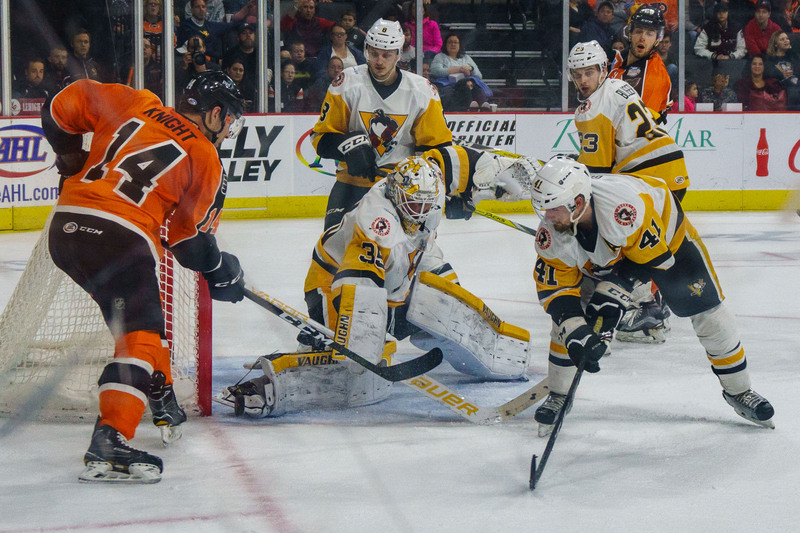 It was an important win as the team had just dumped two games that weekend to other division rivals Bridgeport and Wilkes Barre by a combined score of 6-1. 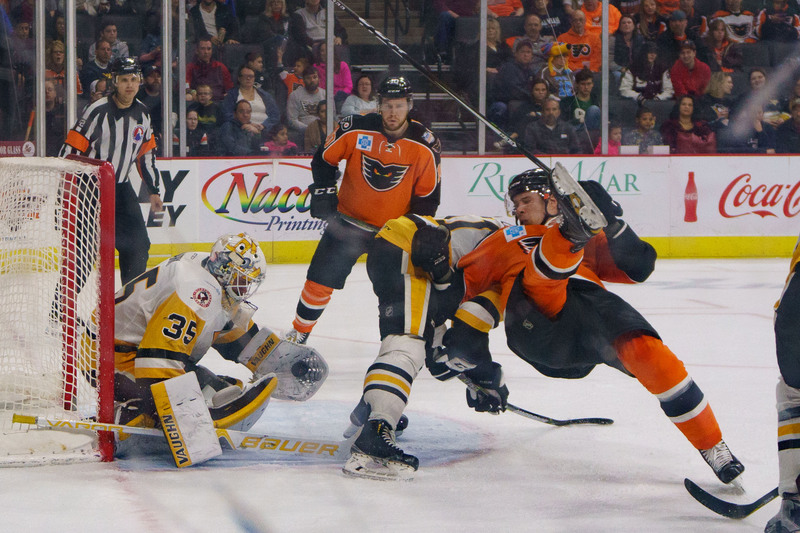 Hershey was also having a bad weekend, but nevertheless the win kept the Phantoms away from the ledge and the danger of missing the playoffs for an eighth straight year. 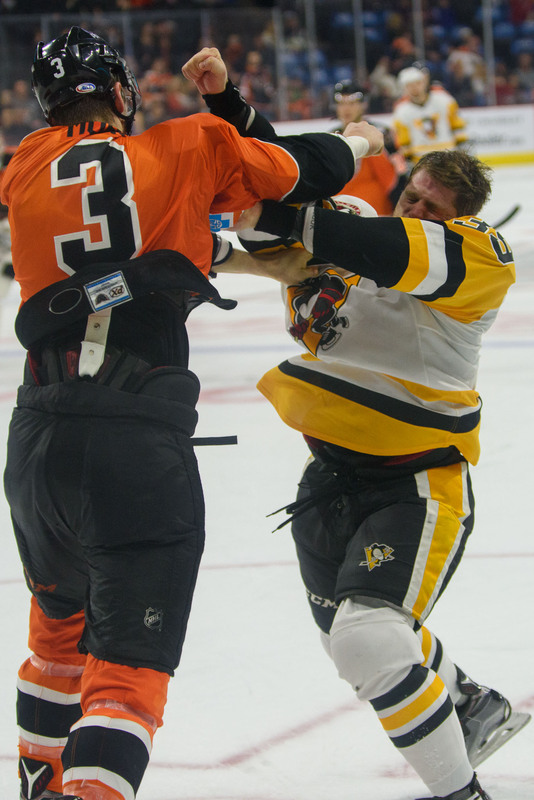 Chris Conner with the hattie was the star of the game Sunday in Hershey versus his former team. Hershey remains the team on the outside looking in, but trails the last of the cool kids by only three standings points. Providence and Lehigh Valley have a “game in hand” on them, and Wilkes Barre has clinched. The Phantoms magic number dropped from 10 to 6 with the win on Sunday, and can drop another 4, to 1, with a regulation win tonight due to tiebreak. With 243 goals this season, the Phantoms are first among all 30 AHL clubs in goals scored this year. What’s more, Lehigh Valley continues to lead the Eastern Conference averaging 3.47 goals per game. With Sunday’s 4-2 victory in Hershey, the Phantoms earned their league-leading 23rd road win this season. Lehigh Valley is an impressive 23-12-1 on the road this year and leads all AHL clubs with 115 road goals scored. The Phantoms are 21-10-3 at home this season and have outscored their opposition 128-104 in games played at PPL Center. Lehigh Valley enters the week second among all Eastern Conference clubs in goals scored on home ice. Phantoms fans have produced 16 standing room-only sellouts this season and have generated capacity crowds in eight of Lehigh Valley’s last 12 home games. F Jordan Weal, expected to return to the Phantoms for the playoffs, did not play in Philly last night due to illness. I want him back for the playoff push but do not bring any sick to the Phantoms locker room please! D Reece Willcox is back with the Phantoms after getting some games with the Royals to remain playoff eligible for that team as well. Defenseman T.J. Brennan enters the week leading all Phantoms and is tied for second among all AHL blueliners in scoring with 55 points (20 goals, 35 assists). He currently leads all AHL defenders in goals (20) and power play goals (11) and is second in both shots on goal (201) and man-advantage points (27). 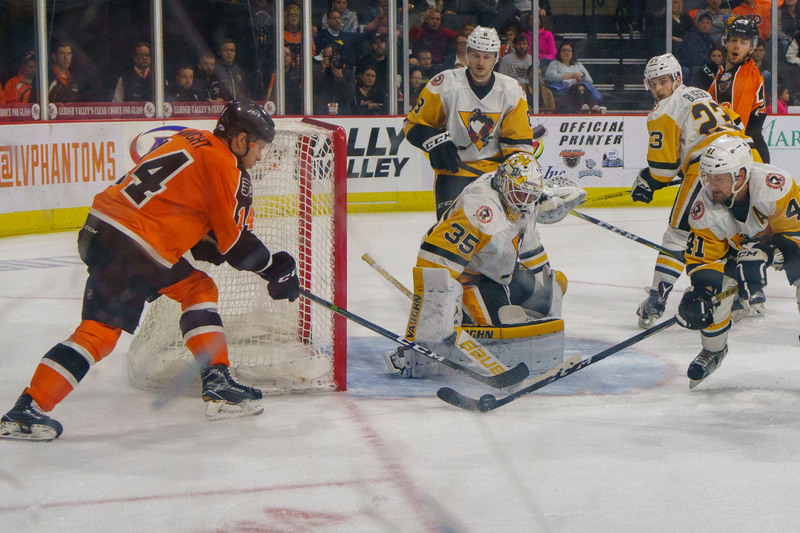 Thanks to his impressive four-point game (3 goals, assist) in Hershey last Sunday, Chris Conner moved into second place on Lehigh Valley’s roster in total scoring with 54 points (22 goals, 32 assists). Conner’s 22 conversions is a new career high for the 33-year-old winger who has now produced five 50-point AHL campaigns during his impressive career. With Brennan (55 points), Conner (54 points) and Andy Miele (52 points), the Phantoms are one of just three AHL clubs (along with Grand Rapids and Hershey) to feature three 50-point producers this season. Reading has clinched playoffs and sit in fourth place in the North division. Second place is within 2 points, so seeding for the playoffs is yet to be determined. The Royals have but three games remaining, all versus Norfolk. Tonight they’re at the Santander, then in Virginia over the weekend. Norfolk is the last-place team in the South, but have played the Royals tough this season. I’ll assume Lyon again in net–he got the win on Sunday and probably not wise to start screwing around with Ouellette in the middle of a week. Can the Phantoms play with the same urgency tonight that they showed on Sunday? Who will step up? We’ve seen Miele and Conner do it lately. I think it’s Laughton’s turn. He’s been quiet lately. They’re all saying “don’t press the panic button” but I was ready to mash it in over and over if we had lost that game on Sunday. Why is it bad to press the panic button? What exactly happens? Can’t “panic” be a good thing in sports sometimes? PS: Oh, forgot to look ahead. Home games Friday and Saturday head-to-head with IronPigs. Game Day setups will be short but posted as per usual. Unless it rains. Last three games are next week, on the road Wednesday and Saturday at Wilkes Barre and Binghamton respectively. Final home game is a week from Friday.